This is part of How to Start a Website section! Here I offer a step-by-step guide on building your business website. Then you will be ready for the next section – WordPress installation! Web hosting and domains are two separate things. They are the core Website Business Essential! The good news is you can use the same company for both. To make things easier, we will be using Bluehost here. I have used Bluehost for years and have had the best experience. I purchased my first domain in 1998 and since then have purchased and helped other people purchase hundreds of domains. I also recommend GoDaddy which I have also worked with. These are both for small business websites. Skill or industry keywords (Take a look at website keyword secrets again). 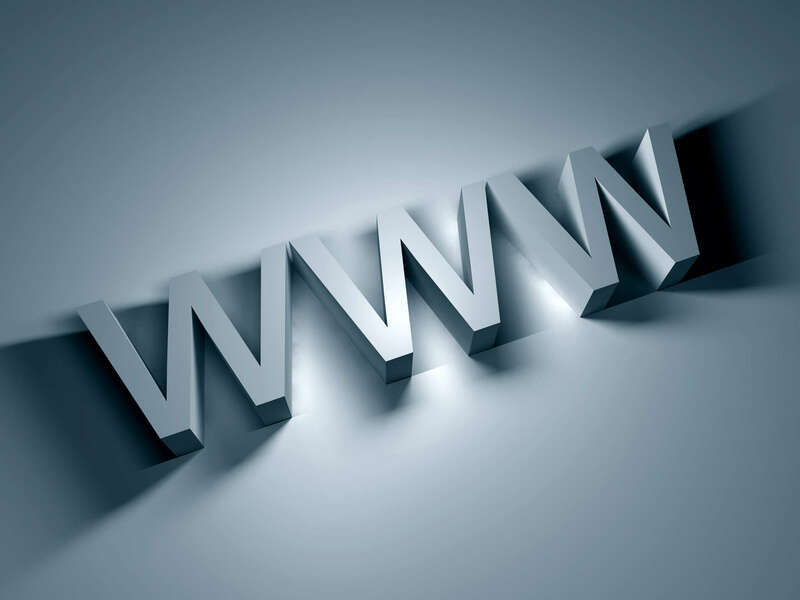 These domain name tips will ensure you will be added to the search engines and will be easily found online. You can always add another domain to your website in the future. Bluehost makes this super easy! To buy a domain you can buy it with your Web Hosting company (I recommend this for small business owners) or purchasing separate with GoDaddy. The next step of How to Start a Website is to buy your web hosting. As mentioned above I like, Bluehost but you can also use GoDaddy. I find Bluehost’s customer service and support more helpful. After you find the perfect domain, go to BlueHost. Here you will be taken to the ‘Sign Up Now’ page. This page will ask you the important question whether you have a domain or not. If you already have domain, enter it in the form under ‘I Have a Domain Name’. If you want to buy a domain name with your hosting, put the domain you want in the text form under ‘I Need A Domain Name’. 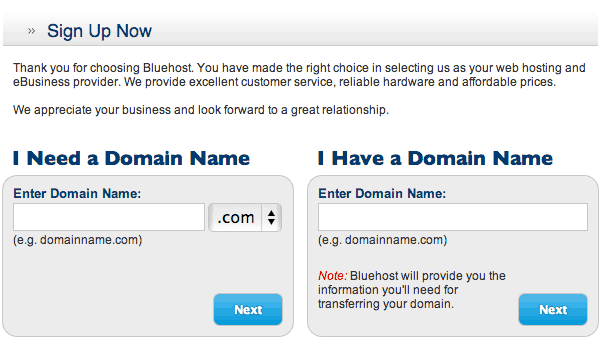 Bluehost offers a free domain for the first year with your purchase. If your domain name isn’t available they will give you suggestions. Look at my above recommendations on choosing a domain name. After you choose which one you want, it’s time to create your account. The first section on this page is the general information. It’s important to give the proper email. Bluehost will email you the important information that you will need to store later on. If you are transferring a domain, do not give your email for that domain. After you put in the above information, it’s time for the technical stuff. These are options that will increase the amount of money you will be spending on your hosting. Like most hosts today, Bluehost sells it’s hosting in one to three years. Like leasing a car. Pick the ‘Account Plan’ that is best for you. Setup Fee – Many hosting companies have a setup fee, Bluehost doesn’t. There is no setup fee. Primary Domain Registration – Bluehost gives you a free year for one domain. If you transfer or purchased a domain elsewhere you will still be able to have a free domain later on. SiteLock Domain Security – This is a great product that secure’s your website and makes sure that your website doesn’t get attacked. It is recommended, however if you are just starting out, you can uncheck this box and add it on later. While your site is small this isn’t going to help that much. Site Backup Pro – This is a backup system that allows you to easily restore your website. It is not needed but recommended. There are other ways to backup your website besides this system. Search Engine Jumpstart – I don’t recommend this at all. There are much better ways to jumpstart your website inside search engines. Domain Whois Privacy – This is a must! If you do not do this, then your information you filed out above (your full name, address and phone number) will be online associated with the website. Many scammers have used this to scare and solicit non technical people in to buying things they do not need. **This will only come up if you buy a new domain with your website. If you are transferring an existing domain, this does not apply. Now complete the form with your credit card information. You will receive your login information. Remember to write down this information and keep this email. Write your login information in your website login spread sheet. If you run into any problems call Bluehost support. They will help you. CONGRATULATIONS! You now have a website. Now it’s time to BUILD it with WordPress. Bluehost and GoDaddy allow multiple domains in your hosting package. Once you buy the hosting package you will just need to pay for extra domains per year. They can be easily added onto your website. There are one of two ways, either as a separate website (add-ob domain) or a parked domain. If you goto www.terrenceculkin.com it will take you to this website as well. I have tried to make it easy for you with the above instructions, but you can purchase a website domain from GoDaddy and have the website hosted on Bluehost. This is a little advanced but Bluehost will give you the instructions on how to change the information on the GoDaddy side. 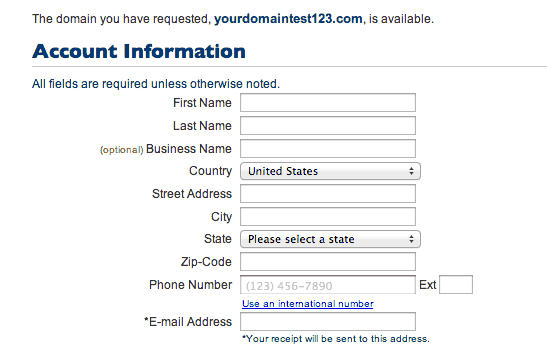 This of course goes with any place (there are thousands of domain registries) you purchase a website domain. Next, is installing WordPress to start your business website!